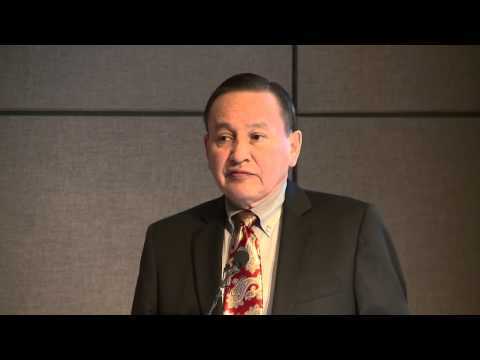 President of the Union of BC Indian Chief's Grand Chief Stewart Phillip speaks compassionately on the great peril mother earth is faced with at this point in human history. Grand Chief Stewart Phillip stresses the importance of united peoples standing up against the wrongs being inflicted upon future generations by corporate interests placed in front of the well-being of all living things. This speaker receives a well deserved long standing ovation for his words of wisdom and his lifelong effort to bring about change to increase the importance and respect we all show for mother nature's irreplaceable gifts. Please visit www.coastalfirstnations.ca/ for an overiew of issues being faced.